The Staple Singers have been performing their blend of gospel, folk and Delta blues music since 1935. From the streets of Harlem to the arenas of Africa to the corridors of the Rock 'n Roll Hall of Fame, their call of peace and compassion has remained steadfast through America's most turbulent times. No matter where their travels took them, the family has always embraced the values of their Chicago home. Chicago Stories tells their engaging story with the help of family members, and such friends and celebrities as Harry Belafonte, Bob Dylan, Natalie Merchant, Jerry Butler, Gene Chandler, Albertina Walker, V-103 Radio's Herb Kent and the Reverend Jesse Jackson. Featured also are a number of The Staples' most popular songs, including "Respect Yourself," "I'll Take You There" and "Why Am I Treated So Bad." Roebuck "Pops" Staples was born in 1915 on a plantation outside Drew, Mississippi. He became interested in the blues at an early age when he met legendary blues man Charley Patton, who inspired him to learn the guitar and greatly influenced his sound. Pops also felt an affinity with gospel music, and when he and wife Osceola moved north to Chicago in 1935, he brought the blues influence with him. As he worked in the stockyards by day, he began to teach his children gospel pieces. "My first memory of where we lived was 506 East 33rd Street," his daughter Mavis recalls. "And in fact, 506 is where we began singing. This is where Pops set us on the floor in a circle and gave us our parts." Natural musicians, they quickly developed a stirring and unique sound. Once Pops determined that they were ready, the family began performing in local churches. They began recording a few years later, and finally broke through in 1956 with the gospel classic "Uncloudy Day." Harry Belafonte sums up the Staple Singers' appeal: "There's hardly a dimension in black life in its richest sense that cannot be found in the music of the Staples. Not only the political and overt social message that some of the songs have, but the religiousness of the spirit. It is the embodiment of the struggle of black people in America." "Pops" Staples passed away in December 2000. The south suburb village of Dolton, of which he had been a longtime resident, has honored his outstanding accomplishments by renaming a street in his name. This edition of Chicago Stories is narrated by performer and multiple Grammy-winner Bonnie Raitt, who in 1992 collaborated with Pops Staples on his album Peace to the Neighborhood. 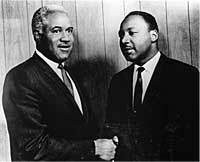 We met Dr. King in 1963 at Montgomery, Alabama. We happened to be there, we were working there that night. And Pops called us all to his room that Sunday morning and said, "Listen you all, I'm going down to Dexter Avenue Baptist Church to see Dr. Martin Luther King. I've been hearing this man and I want to see him and I want to meet him." So he wanted to know if we wanted to go with him. We said, "Yeah, Daddy, we want to go." We all went to his church at 11 o'clock service. Dr. King was a young man. Coretta King was singing in the choir, she had a baby in the arms. And he acknowledged us and at the end of the service, Dr. King stands at the back of the church at the door, to shake hands with everyone. And he spoke to Pops. He talked for a while. We get back to the hotel and Pops called us to his room again. He said, "Listen you all, I really like this man's message. And I think if he can preach that, we can sing it." And we said, "Okay, Daddy." So we started writing protest songs. Our first protest song we wrote was March Up Freedom's Highway. That was for the march from Montgomery to Selma. Then we wrote Washington Is A Long Walk to D.C. for the march to Washington D.C., and on and on. We'll Get Over. When Will We Be Paid For The Work We Done. We joined the movement. We traveled with Dr. King, to help raise funds for the movement. Pops wrote a song called Why Am I Treated So Bad. He had seen the Little Rock 9, you know, we were sitting in the living room, watching the news, Pops laying back in the recliner. And everyone had given these kids permission to go to school, I mean, to board that bus. The governor, the mayor, the president. Everyone had given them permission to board the bus. This particular morning when they got ready to board the bus, a policeman put his billy club across the door. And Pops laying back in the recliner, he said, "Now why they doin' that? Why they treatin 'em like that? Why they treatin 'em so bad?" He started writing that song right then. And that turned out to be Dr. King's favorite. Any time we were together, he would say, "Stape, you gonna sing my song tonight, right?" Pops said, "Yeah, we gonna sing it, Doctor, we gonna sing it." So that was some cherished memories, meeting Dr. King and, and traveling with him, listening to him speak every night. Just moments you'll never forget. It was gospel, but with a style that was different. That style had that Delta Blues that Pop Staples had learned. Pop was from the Delta, the deep Delta Mississippi. But what made them even more different was they evolved from being just gospel and spiritual to being more folksy and more contemporary. They would talk of running down the highways on their trips writing songs, speaking about the objective conditions of social segregation. And many groups accepted their place in the back of the bus. The Staples did not. That was a dignity factor. I have to say that the Staples were the forerunner of taking the music message to another level. Most great singers sing love songs or they sing blues songs. But the Staples unabashedly sing songs Dr. King could identify with. And we talk very much about the Staples, they became stars, but like low hanging grapes of the vine, they were stars that we could touch. I mean, they never got disconnected from our stratosphere. The Staples became kind of a everyman's group as it were. You know, we are combinations of our nature, our parents' genes, and our environment. I mean look at the Staples' environment. Mavis Staples and Pops and Pervis and Cleo, they knew Sam Cooke. They traveled with the Pilgrim Travelers, with the Dixon Hummingbirds, with Jimmy Jones Harmonizing Four, with the Caravans. With Lou Rawls when he was with the Soulsters before he went solo. They traveled with Johnny Taylor, with Aretha Franklin, with Reverend Sierra Franklin. And many of them ate dinner at the table of the Staples, 'cause Mom was a great cook. And the family, when the groups would come to town to sing at DuSable or some place, invariably at that time they really couldn't eat downtown, number one. But to have a home cooked meal, we would always end up at the Staples home. And so they became the table to all these great artists. You know, if the walls in the Staples home could talk, they'd have many messages and much music. [With] the Staples it was this combination of music and message that I call soul and science. And they were talking that relevant talk. You could demonstrate to their music. Or you could shout to their music. The Staple Singers were unabashedly freedom fighters. The rappers are now into the message of sorts. And often the message was a kind of raw vulgarity and sometimes barbarity. Staples never crossed that line. They had the gospel foundation. Sometimes the blues beat, but the message of liberation. Read the lyrics of their songs, you will find a message that moves people. Staples became fusion. They became the bridge between the gospel and the blues. Gospel and the blues both have very sad origins, born of pain. Difference is in the blues, you go down twice, you come up once. In the gospel, it's always a "good news" ending. There's always some resurrection beyond the crucifixion. There's always some brighter day ahead, beyond the clouds of today. And the Staples had that connection of blues origin and gospel ending. And that's why they are cherished and legendary. In many ways, they are a global treasure. And I've seen them sing [in rural areas] where they had huge crowds, and kind of not be respected enough in Chicago. Chicago does not appreciate the Staples like it appreciates the Blues Brothers, but it ought to. The Staples are very much a part of the huge cultural tradition. "Pops" Staples and daughters Cleotha, Yvonne and Mavis in performance in Africa. How in the world do you think anybody's s'posed to respect you?